Because it is relatively uncommon to find sources of birth dates before the start of civil registration in England in 1837, it is a widespread (and I think not unreasonable) convention for genealogists to assume that the year of birth is the same as the year of baptism. There are many reasons why this assumption may fail, but that is beyond the scope of this question. Have there been any studies looking at the average time between birth and Anglican baptism in England in the early nineteenth century? Population Studies from Parish Registers, a selection of readings from Local Population Studies, edited by Michael Drake (Local Population Studies, 1982, ISBN 0 9503951 7 X). It contains 8 papers with detailed statistical analysis of age at baptism. They cover parishes in London, Liverpool, Melbourne (CAM), Colchester (ESS), three parishes in Bedfordshire; four in Somerset and four in Flintshire. Unfortunately there's too much information to summarise. There are further papers on marriages, burials and migration, and two broader population studies. I decided to perform a little experiment with some data from the relatively small parish of Caunton, Nottinghamshire. The baptism register from 1785 to 1812 reliably recorded the date of birth. During this period there were 354 baptisms, of which 341 had a plausible birth date recorded (a small number were illegible or impossible [i.e. baptised before born]). I calculated the age at baptism and produced the following graphs using Microsoft Excel. For background, according the 1801 census statistics for Caunton there were 67 houses occupied by 73 families, and a total of 366 inhabitants. Caunton was the only village in the parish, although there were a couple of small hamlets nearby (Knapthorpe and Beesthorpe). Most parishioners would not have had to travel very far to baptise their children. 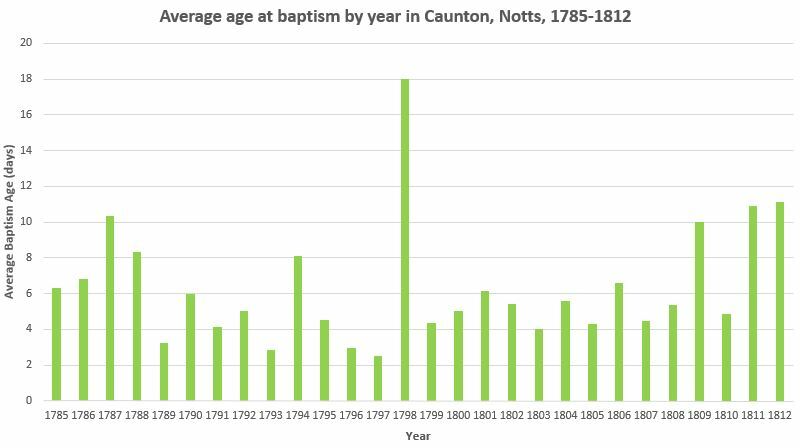 Looking at the average age at baptism by year indicates that in this parish there was not a great deal of change over this period in terms of the average baptism age in days. Note in 1798 the data is a little bit skewed because the sample size per year is quite small and there were two later baptisms that year. Looking at the number of baptisms by age is also interesting. Over this period there were 39 baptisms on the day of birth, and similar numbers over each day in the first week after birth. Interestingly there is a significant drop off after the age of 7 days which suggests that some effort may have been made to baptise within the first week of life. 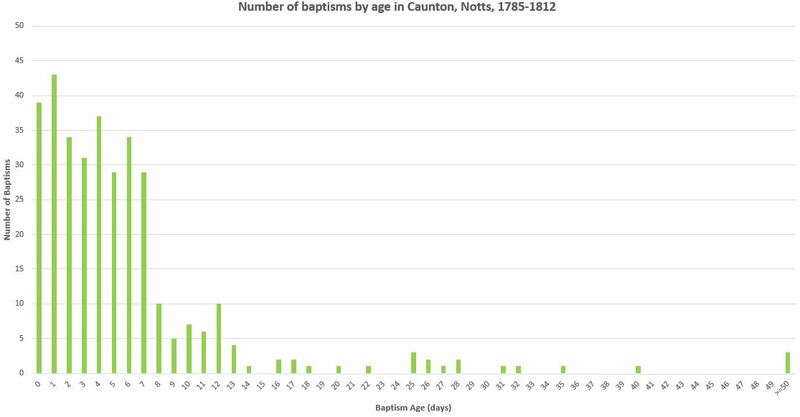 From this we can see that 75% of children in Caunton were baptised within the first week, and 98% within the first month of life. No doubt these statistics will vary depending on the location. I am sure this being a small rural parish will have made a difference as compared to a busy city parish. I would be interested to see other examples if anyone can find data or studies from other areas of the country. Not the answer you're looking for? Browse other questions tagged england statistics baptism-practices anglican-church or ask your own question. To what extent would people in the 1800s travel to get married? Is the term “baptism” or “christening” more accurate in old parish registers? Does the Church of Latter Day Saints perform a 'baptism for the dead' ritual for everyone they obtain records for?